Kesar or Zafaran is known as Saffron in English. The threadlike part of Zafaran flower is used for many health and medicinal purposes. Like vanilla and clove, saffron is one of the spices that many people keep in their kitchens and that they often use to flavor preparations, both sweet and salty dishes. However, few people know the incredible properties that this spice possesses and the different uses attributed to it, beyond those that have been given to it in the culinary world, today in this article your will learned about saffron, what it is? Where it comes from, what are its benefits and properties, and many other things that you will like to know? What and how is saffron? Crocus Sativus is better known as saffron, it is a bulbous plant that measures between 6 and 10 cm high, and is characterized by having elongated leaves in the form of strips, about 3cm long, adorned by small hairs on the margins and a thin line, whitish and longitudinal along its surface. This plant has beautiful violet flowers, with bright yellow or orange stigmas, which are what we know as seasoning or spice or Kesar, and also have medicinal properties. Where did Saffron originally come from? Now you know what and how saffron is, you’re probably asking yourself, where does it come from? Well, this species finds its origins in the eastern Mediterranean, although some associate it with the Middle East and ancient Mesopotamia. Its arrival to Spain was propitiated by the Arabs and from there it was expanding until being known in the rest of Western Europe. During the time of ancient Egypt, the pharaohs used to worship this spice, using it as a key ingredient to embalm the dead. On the other hand, the Persians used it to dye garments and to aromatize, while the Greeks used it to give a pleasant essence to their clothes and their salons. As a curious fact, it is said that the cloak of King Henry VIII of England was dyed with saffron, like the mantles of many Buddhist monks. In case you did not know, saffron is not only spice with an incredible aroma and flavor, but also has extraordinary properties that promote our health, and also have a considerable amount of nutrients to provide the body. To give you an idea, 100g of saffron provide 310Kcal, 65.37 g of carbohydrates, 11.43 g of protein, 3.90 g of fiber and 6 g of fat. In addition, this spice is an important source of vitamins of groups A, D, C, B1, B2, B3, B6 and B12, and minerals such as magnesium, iron, phosphorus, potassium, calcium, and zinc. Digestive: its bitter taste increases the salivary secretions, and its crocin content favors the production of bile, also preventing the formation of kidney stones. Carminatives: helps eliminate and prevent intestinal gas. Antispasmodic: helps to relieve cramps, contractures, and spasms. Anti-inflammatory: serves to reduce inflammation, especially at the stomach level. Antibacterial: this spice helps eliminate bacteria in the body, preventing possible diseases and infections. Antioxidants: contains vitamin C that acts as an antioxidant, helping to fight free radicals that cause the aging of cells. Analgesics: relieves pains of both head, menstrual and muscle. Antidepressants: Saffron also helps by stabilizing the mood, reducing stress, anxiety, and depression. Sedative: it is said that saffron helps to sleep, fighting insomnia. In addition to its culinary uses, saffron has served to relieve a large number of ailments in the body, this thanks to its multiple therapeutic properties. In this way, this spice has been used in the treatment of stomach and menstrual pain, constipation, gas, abdominal inflammation, muscle pain, impotence, and insomnia, among other problems that diminish our quality of life. For impotence: it is recommended to boil 1L of water and add 0.5g of saffron stigmas, and drink this infusion twice a day. For hair loss: mix licorice powder and a pinch of saffron in 1 glass of milk, and apply on the scalp at night. For Alzheimer’s: 1 cup of water should be boiled with 1 teaspoon of ground ginger and 1 of saffron. Once I warm the infusion, drink it in the mornings. For constipation: put 1g of saffron 4g of saffron, 30g of senna, 24g of ground rhubarb, 4g of cloves, for at least 6 days, and drink 5 tablespoons of liquid, 1 hour after dinner. In addition the uses of saffron, this spice has other applications that you may not have known about. 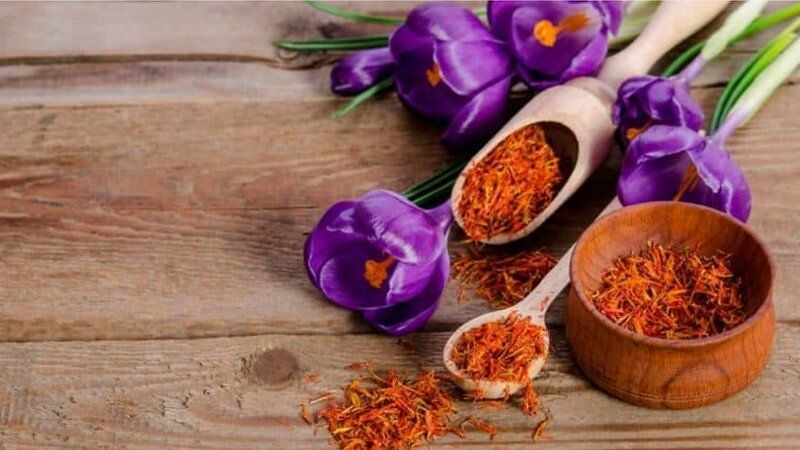 Esoteric Uses: Believe it or not, saffron has important magical properties, so it is used as an amulet in different rituals that seek to attract love, promote sexual relations and even ward off bad energies. For the clothes: This spice gives off a very particular dye that is used to dye clothes. Formerly, when couples got married, they had their clothes with saffron as a sign of union. What benefits do we get from saffron? It inhibits the proliferation of tumor cells, thanks to its crocin content. It fights gingivitis and pain in the gums. Improves digestion, eliminates gas and relieves constipation. It can serve as a treatment for asthma. Improves mood, fighting depression and anxiety. Help in cases of iron deficiency anemia. Improves the appearance of the skin and benefits the eyesight. Contraindications and side effects of saffron? Although it is true that it is a very beneficial spice for health, there are some contraindications and side effects that have been linked to the saffron consumption, which must be taken into account, in order to avoid complications. Pregnancy, because it could stimulate the contractions of the uterus and cause abortions. Metrorrhagia, because it could increase the bleeding. Bipolar disorder, since it could produce excitability and worsen the symptoms in patients suffering from this disorder. Medical treatment with anticoagulants, antidepressants or medications for hypertension. Dose: For this reason, it is recommended to consume no more than 1.5 g of saffron per day.